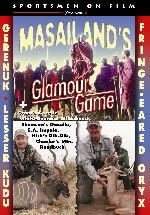 The "Big 3" of glamour game in Masailand are the highly-prized "21-day animals" that are both unique and difficult to hunt. They are the Gerenuk, Lesser Kudu, and Fringe-Eard Oryx. A Sportsmen on Film DVD production. The "Big 3" of glamour game in Masailand are the highly-prized "21-day animals" that are both unique and difficult to hunt. They are the Gerenuk, Lesser Kudu, and Fringe-Eard Oryx. 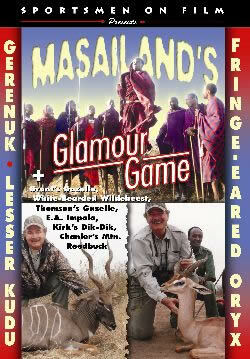 Led by Professional Hunter Peter Dafner of P.D. Safaris, Ken Wilson successfully hunts the "Big 3" in the Mto Wa Mbu hunting block, plus he is able to add excellent specimens of Grant's Gazelle, Thompson's Gazelle, White-Bearded Wildebeest, East African Impala, Kirk's Dik-Dik and Chanler's Mountain Reedbuck.